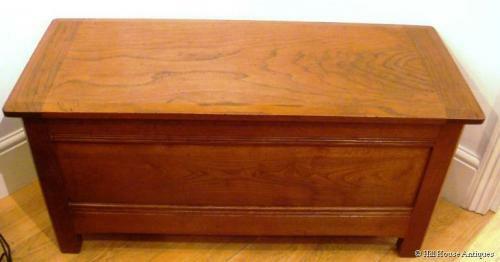 A good walnut Cotswold School coffer/blanket chest by Stanley Webb Davies of Windermere; c1950`s. Part of a special ongoing commission he undertook for his client friend, the artist John Michael William Crowther. Fully stamped and marked with the SWD cartouche for 1958 as well as a SWD paper label with client details. Approx 37" wide, 15" deep and 18" high.